LTTE suicide cadre has blown himself killing 14 civilians including the minister of highway and road development, Jeyaraj Fernandopulle,K.A. Karunarathna, the former national marathon champion and South Asian marathon gold medalist, Luxman Alwis, the national athletic coach and Chief Inspector K.D.R Kannangara, personnel security officer to the minister were also among the dead. Further, 83 people have already been admitted to the Gampaha hospital following the suicide attack and 15 among them are in critical condition. Gampaha Division SSP Hector Dharmasiri who received critical injuries has been admitted to the General Hospital in Gampaha. 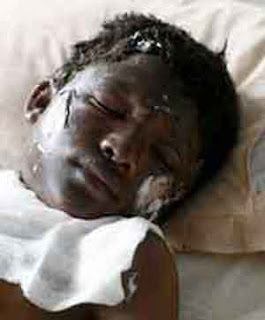 The LTTE suicide cadre who targeted Minister Fernandopulle had come in the guise of a marathon runner participating at the New Year sports event. National Athletic coach Lakshaman De Alwis ,Sri Lanka’s ace marathon runner K.A. Karunaratne is also among those killed .Gampaha Division SSP Hector Darmasiri was also seriously injured and admitted to the General Hospital at Gampaha. Minister Jeyaraj Fernandopulle was killed following the blast in Welliweriya this morning. 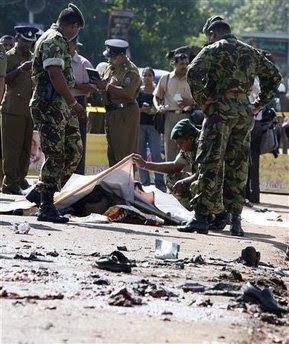 The blast occurred when he was about to flag off a marathon run as part of a Sinhala New Year celebration.Other 10 person also died. over 50 people were admitted to Gampaha Hospital and more casualties were been received at the moment.